In recognition of the U.S. Independence Day the Democratic People’s Republic of Korea launched some remarkable fireworks. 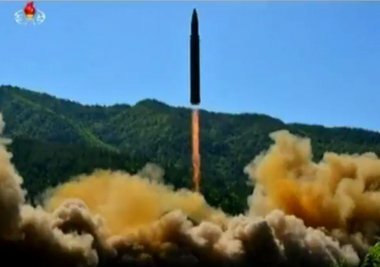 DPRK State TV confirmed a successful launch and the basic data others had measured (video). The announcement comes nearly exactly six month after President Donald Trump issued this prediction. That forecast turned out to be false. More official pictures of the launch were published. The North Korean head of state Kim Jong-Un attended. North Korea fired the missile at a steep trajectory reaching a very high apogee. This limited the range of the test launch. The flight time of 37 minutes was extremely long. Recalculating the data into a more normal trajectory the maximum flight range of the missile is estimated to be 6,700 kilometers with a normal payload. Launched from North Korea it could cover Alaska but not the lower 49 states. With a light warhead, possibly a small nuclear load, the range could be up to 10,000 kilometer and cover at least the north-western states. Trump will be rightfully blamed for the braggadocious formulation of his tweet. 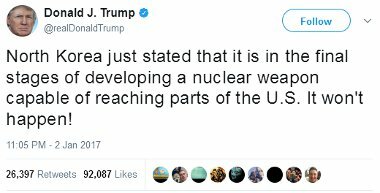 But one can not blame him for not stopping North Korea’s missile development. A war on North Korea would also destroy South Korea and have implications far beyond the peninsula. Only the end of U.S. military maneuvering around Korea and the perspective of a full peace agreement could have achieved a stop of North Korea’s development. The U.S. Congress would support neither. Trump tried to press China to reign in North Korea, But China has no reasonable way to do that. One could just as easy blame former U.S. presidents – Clinton for breaking his agreements with North Korea, Bush for his general hostility and Obama for his do-nothing excuse of “strategic patience”. North Korea has very good reasons to perceive the U.S. as vicious enemy and to never trust any U.S. statement or agreement. It needs nuclear weapons for its self-defense. As it can not trust any of its neighbors it needs strategic independence. That has now been achieved. The U.S., and Trump personally, has been just been “shown the finger” by a small underdeveloped state. One wonders how Trump and the official U.S. it will react to that. All images in this article are from Moon of Alabama.